One of Atlanta’s longest-standing dermatology practices, Dermatology Associates of Atlanta, is proud to now offer three new treatments to provide their patients with the latest advances and best in skin care from head to toe. For over 40 years, Dermatology Associates of Atlanta has earned a reputation as one of the most advanced and innovative dermatology practices in Georgia. In 2018, they’re thrilled to continue this endeavor by adding three new innovations in skin care technology: LaseMD™ facial rejuvenation, EMSculpt® nonsurgical fat reduction and muscle toning, and new Vbeam lasers for vein and redness reduction. Laser treatments have become a popular way to reduce signs of aging, and LaseMD™ facial rejuvenation is among the newest innovations in this category. As a non-ablative laser (which offers significantly less recovery time), LaseMD™ treats age spots, sun damage, fine lines, and wrinkles. As effective as the treatment is for the face, neck, and décolletage, it also boasts minimal recovery time and convenient treatments that take just 5-20 minutes. To help their patients learn about the new procedure, Dermatology Associates of Atlanta (DAA) is also hosting a Lunch & Learn on July 11th, 2018 from 12pm – 2pm. Interested patients can RSVP to 404-256-4457. Nonsurgical fat reduction has been booming over the past few years, but EMSculpt® is truly unique because it’s the first fat reduction treatment to also tone muscle. As Dermatology Associates of Atlanta founder Dr. Edmond Griffin explains, “We already offer several methods of nonsurgical fat reduction, but EMSculpt® muscle toning and fat reduction is a game-changer because it actually builds muscle in the area too. In other words, you can reduce belly fat and build your abs at the same time.” The technology is expected to be released in late summer, but DAA already has a waiting list so interested patients should call to schedule a consultation. For aging patients as well as their younger counterparts, facial veins and persistent facial redness are common cosmetic concerns. Vbeam lasers have been used at DAA and other practices for years and are specifically designed to target and break down unwanted vessels, giving patients a smoother complexion. “I use Vbeam lasers to reduce skin redness in many of my patients with rosacea, but it also does a great job for patients who don’t have rosacea and who just want to get rid of some excessive redness or facial spider veins,” says board-certified dermatologist and partner at DAA Dr. D. Scott Karempelis. While DAA has long been offering this treatment, this summer they’re stepping up with two of the newest, more advanced models of the laser, called the Vbeam Prima. The treatments above are just a few of DAA’s most recent additions, along with NeoStrata® ProSystem Retinol Chemical Peel, Omni growth factors, and Biopelle® skin care products. Staying on the cutting edge of skin care allows DAA to maintain their reputation as one of the best and most awarded dermatology practices in the entire metro Atlanta area. To learn more about these and the dozens of other procedures offered at Dermatology Associates of Atlanta, patients can visit dermatlanta.com or call 404-256-4457 with their questions. Dermatology Associates of Atlanta (DAA) is an all-encompassing dermatological practice founded in 1978 by Dr. Edmond I. Griffin. Joined by partners Drs. D. Scott Karempelis, Joseph R. Payne, and Ashley R. Curtis, and an exceptional team of providers, the practice continues to serve the Atlanta, Georgia area for over 40 years. 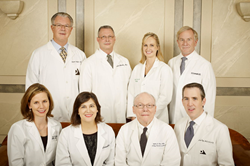 The medical providers at Dermatology Associates of Atlanta have over 150 years of combined experience in their fields. In addition to providing general and cosmetic dermatology services and Mohs surgery for skin cancer removal, Dermatology Associates of Atlanta has ten in-house specialty centers, including our on-site Surgical Suite, The Laser Institute of Georgia, Skin Medics™ Medical Spa, The Psoriasis Treatment Center, The Griffin Center of Hair Restoration & Research, The Eczema Center, and more.